Every individual is unique, and so is your individual plan of care. With your physical and emotional well-being always in mind, our staff will implement a personal approach from the first day you arrive. At our Atlanta home, you and your family will be a vital part of our team – from the Attending Physician, nurses, and pharmacists – to therapists, and social services and activities directors. We are dedicated to helping you lead a healthy, fulfilling life. Everything we need to treat the “whole person” is under one roof. 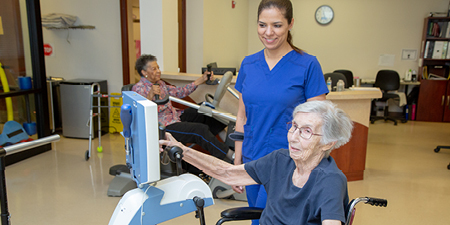 Our Atlanta rehab center includes leading-edge therapy equipment and therapy pool to help you recover from surgery, an injury or illness. You can also take advantage of our wellness programs, or plan an outing with our activities director. We also offer visits from specialists such as podiatrists and dentists to address your individual needs as well as daily delivery of medications. Attention to detail makes A.G. Rhodes an inviting place to live – whether it’s for short-term rehabilitation or long-term care. Below are many of the services that our Atlanta rehab center and home offers.